DAMN. is also the rapper’s third album at the number one spot on the Billboard 200. After a week of rumors about a second album, a coachella performance, and a music video featuring Don Cheadle, the numbers are officially in for Kendrick Lamar's DAMN. As reported by Billboard, as of April 20th DAMN. had moved 603,000 units, which was higher than all original projections. 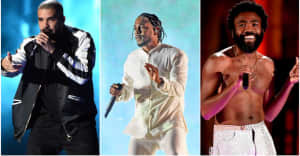 This is the third album of Lamar's to top the Billboard 200, with To Pimp A Butterfly and Untitled Unmastered topping the charts in 2015 and 2016, respectively. DAMN. has moved the most units in a single week since Drake's Views from 2016. You can listen to DAMN. here.